Turn Neither to the Right Hand nor to the… Wait… Mom, Which One is My Left? I saved this whole article in my BibleWorks notes. Not long ago, a team of researchers watched a 1-year-old boy take justice into his own hands. The boy had just seen a puppet show in which one puppet played with a ball while interacting with two other puppets. The center puppet would slide the ball to the puppet on the right, who would pass it back. And the center puppet would slide the ball to the puppet on the left . . . who would run away with it. Then the two puppets on the ends were brought down from the stage and set before the toddler. Each was placed next to a pile of treats. At this point, the toddler was asked to take a treat away from one puppet. Like most children in this situation, the boy took it from the pile of the “naughty” one. But this punishment wasn’t enough — he then leaned over and smacked the puppet in the head. From Sigmund Freud to Jean Piaget to Lawrence Kohlberg, psychologists have long argued that we begin life as amoral animals. One important task of society, particularly of parents, is to turn babies into civilized beings — social creatures who can experience empathy, guilt and shame; who can override selfish impulses in the name of higher principles; and who will respond with outrage to unfairness and injustice. 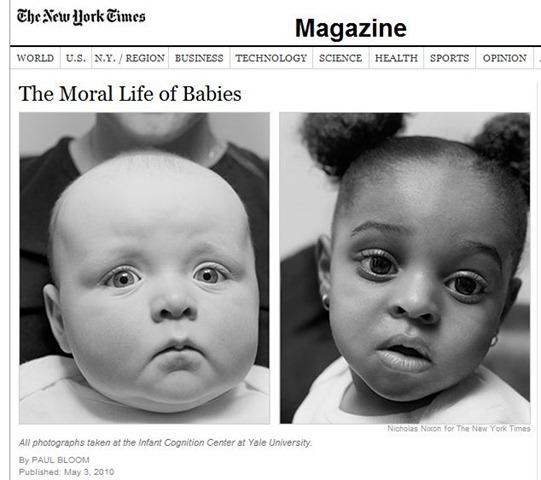 Many parents and educators would endorse a view of infants and toddlers close to that of a recent Onion headline: “New Study Reveals Most Children Unrepentant Sociopaths.” If children enter the world already equipped with moral notions, why is it that we have to work so hard to humanize them? A growing body of evidence, though, suggests that humans do have a rudimentary moral sense from the very start of life. With the help of well-designed experiments, you can see glimmers of moral thought, moral judgment and moral feeling even in the first year of life. Some sense of good and evil seems to be bred in the bone. This is pretty well perfect for a sermon: A human interest story involving the cutest category of human. A statement of the “worldly” view. An unwitting scientific affirmation of Paul’s view. I get innumerable illustrations from the New York Times.